Maybe war is too strong of a word, but skirmish or dust-up just didn’t sound as cool in describing what happened to me on Twitter in the days following Alabama beating Notre Dame for the National Championship. Now don’t get me wrong, my allegiance has always been with the Southeastern Conference, including all of the previous six national championship games. But I was more torn about which team to pull for in this year’s game than I was last year when Alabama played LSU for the title. I went to school in Alabama, at North Alabama – where the football team won three straight Division II national titles in the mid-90s when I was the Sports Editor – so I know how rabid fans are in the state. Don’t even think about trying to schedule an event during the Iron Bowl. I have great respect for the Bear. I grew up a big Bear Bryant fan. I have four books on him and a framed article of him hanging on my wall in the basement. But over the past few years the Alabama fans have really come out of the woodwork and most some of the fans, but not all of them, are so obnoxious that part of me wanted to see the team lose just to shut some of them up. So I didn’t think anything about offering some words of encouragement to Tim Brando, an announcer for CBS Sports who also has a nationally syndicated radio show, when he was getting bombarded with some vicious tweets from some of Bama’s finest. 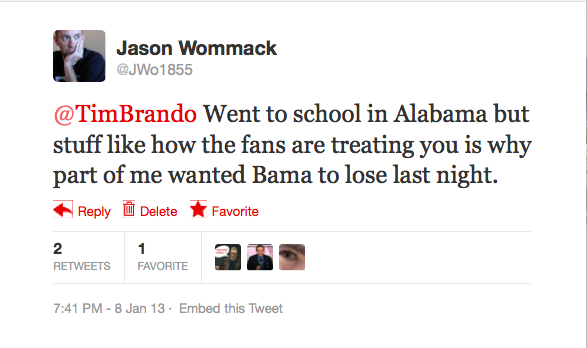 My Tweet that caused an uproar in Alabama. I was excited when he retweeted my post and even had some fun with my friend Daniel, sending Brando some tweets about the crazy fans. 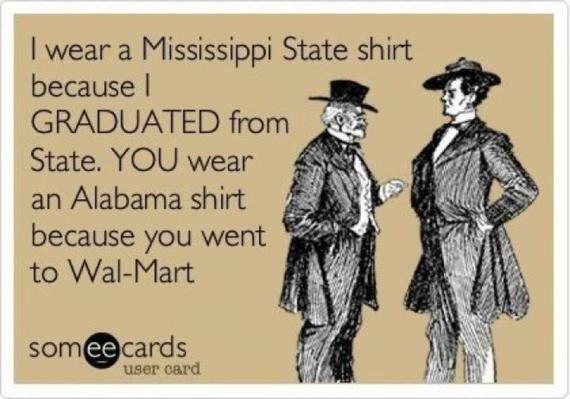 Daniel, who graduated from Mississippi State, once posted this e-card in reaction to some of the Alabama fans who were flooding Facebook with their Roll Tide Roll’s, also known as RTR. We had a few laughs about our tweets and I didn’t think anything else about it until I noticed I had a few responses… from Alabama fans. I guess I WAS wrong about going to school IN Alabama, because according to this guy I have pledged my allegiance to Tuscaloosa without ever having stepped foot on the campus. Just as I was about to post this, I got this response from Tallulah. Then there was The Alabama Boss. He is EXACTLY the person that even had part of me wanting Alabama to lose. After looking at his Twitter feed, I’m pretty sure this guy prolly couldn’t even spell ACT, much less score high enough to get into Alabama. Plus he’s talking like moving to Mississippi would be bad thing, so how smart could he actually be, right? To be fair, there are a lot of my friends who are Alabama fans that aren’t like these lunatics. They have been fans for years and aren’t obnoxious, but it seems like for every one of them there are four more like The Alabama Boss. I get it, your team is doing great and they may very well win four more titles in the next five years, but I think some of the crazy fans should take some of Bear’s advice. I don’t know what class is, but I can tell when one has it. You can tell it from a mile away. Gallery | This entry was posted in Daily Life and tagged Alabama, daily life, Football, humor, Postaweek2013, social media, sports, twitter. Bookmark the permalink. | The Life of J-Wo <Loved it!